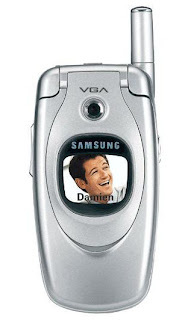 This Samsung mobile phone is not new, in fact, I had one back in 2005 and I lost it (stolen?). This is my favorite cellphone ever. It is not high tech, it only has a VGA camera and it is very tiny. I am guessing I can get a model like this now for less than 5,000. I hope I find one! Wednesday, 27th of August - San Miguel Ave. It was the launch of SMC's Oktoberfest, this time 120 days of friendship and beer! I headed straight to the San Miguel compound where the party was starting and pulsating beats are already heard across the streets. Rivermaya and Stone Free were just some of the bands who graced the Oktoberfest Press Launch. Rivermaya with their new vocalist, performed the Oktoberfest Ciento Bente (120 days) song as their last performance and every one was served with the limited edition Oktoberfest beer. The beer is smooth and best served zero degrees. I also won a Timex watch during the raffle! There was an open bar with free flowing San Miguel beer and a buffet table filled with pasta, spare ribs, etc. It was a fun night and a perfect venue to celebrate friendship and the good things in life. This is just a preview and I am excited for September 5 - Friday! The whole stretch of San Miguel Avenue will be serving beer and bands will perform as Pinoys try to get to the Guiness Book of Records for the most number of people toasting and the longest beer bar ever! I'll mark the date and it is the perfect way to kick-off the weekend next Friday :) see you all there! This is our view from the bedroom, it's good that I took the time to photograph the moon and the skies so I can go back and remember how lucky we are and how beautiful life is despite of. No one can take this away from me and I will always have this view :) The structure is a Church of the next village and the trees are our own. I realize now why sometimes we are given hard and trying times, that is to appreciate the good in life. I had a wonderful evening after work with my family. My partner picked me up from the train station and my pulsating headache (which I had the entire day) suddenly melted away. My mom prepared me watermelon shake and we all looked at my niece's newest photos, her 100th day at Prep school. Now I have everything I need to face a new day tomorrow. We also enjoy the fruits of our papaya trees, guyabano, langka, guava, and banana. Thanks be to God and to Mama who is blessed with the talent to grow plants and trees. iPhone is now available in the Philippines, this time not from Greenhills but legally, through Globe Telecoms. iPhone is available to everyone which is great! Whether you are a prepaid user, postpaid subscriber, or you can avail of iPhone 3G Globe plans as low as Php 1,599 per month. I have my eyes on the 1,599 pesos Globe monthly plan for iPhone - but it has a 2 year lock in period. 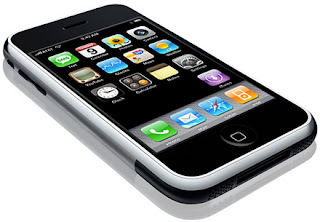 Existing postpaid subscribers can dial 211 to know about iPhone offers available to them. I am a postpaid subscriber, maybe i'll call later but I think its more suitable to get an iPhone plan which has free wifi hours, free Wiz wifi hours, talk hours, and free texts. Yet I know that iPhones are selling hot in the Philippines, have to ask about the availability of units as well. It was Friday and I was exhausted from the week that was, but I just could not resist another trip to Eastwood City where Gary V would be performing on stage. The event was a real pick me upper, Gary V is entertaining and inspiring at the same time. It was a perfect evening that melted away all the stress. During the concert, I could not help but notice the lighting system - when Gary V sang "Take me out of the Dark" I felt as if I was in heaven! well, I wished - but thank you Gary V for reminding us that the Lord will not give us something we can't bear, Amen. His performance of my favorite song "How Did you Know" (from the movie of Aga and Kristine Hermosa heehee :) was also great, hearts were all over the place and it matched the cozy atmosphere of the venue. Gary V's concert in Eastwood City, Libis felt like a private function where he was able to get near the audience and wow, he was just in front of me singing "Because of You", this can only be achieved in an intimate venue like Eastwood City. Every person in the audience had smiles on their faces, old and young people were cheering for Gary V. An old couple in front of me heartily waved good-bye and everyone was happy and re-energized after the concert. Thank you very much to Eastwood City, me and my friends had a great time! I managed to bake a cake today, actually two cakes! It's a long weekend and I am getting the most out of it. And here is the first of the two, a carrot cake with cream cheese on top. It's heaven! Just slice cream cheese right out of the box and put it atop a warm slice of carrot cake. I took several shots from the runway and the event was great with all the food and gorgeous people! This Saturday is great, I went to the office for a couple of hours after Azrael and I had a Filipino breakfast at Jollibee and he waited for me until I finished all my missions. We walked to Shangri-la, browsed some books and decided to head over to Rockwell. I have been waiting to dine at Pepper Lunch in Powerplant Mall and today it finally happened. It was our first time so we just ordered Beef Pepper Lunch with extra beef and Azrael had Curry Beef Pepper Lunch. The food was served on an electro magnetic plate and there's a sense of urgency that one has to mix it all up and flip over the meat. We enjoyed cooking our pepper lunch! I just had to order the Matcha cheesecake, I love Matcha green tea which is being sold in Pearl Drive, now I know Matcha is also good on cake. We cannot wait to try the other meals, my next mission is to devour their steaks and the chicken Teriyaki. My weekend is rotten and I just got back from the mall because I can never rest in peace at home. Everyone was pleased when I went out and so am I. I just finished munching on fast food again and I promise not to eat another hamburger this week! I have referred to laing in my blog several times and tonight, it is my only hope for happiness. I love laing and I can eat it everyday. There was nowhere else to get it from but Goldilocks, they also sell laing in tetra packs so you can bring it anywhere. I was tempted to get one of the packed ones and stick it in my work bag, ready to eat anytime but I figured it should be filled with preservatives. I just bought two orders of freshly cooked laing and I will devour it during dinner. Thank you very much to Coke for throwing another great party last night at Taste Asia. Not only that, thank you for making my partner Azrael win the Video Blog Contest! There's also unlimited drinks and an open bar. It's great to see familiar faces and congratulations to all the winners! I admire different types of Louis Vuitton bags but I know nothing about them - absolutely. I just know that they are pricey and especially designed and made by the likes of Marc Jacobs. They are hard to find which makes these bags much more special. Tonight I saw this Louis Vuitton bag from my favorite blog - chuvaness. I am in like! I wish my sister Joni gets one, she is the brand person in the family and I am just happy to know that she has all these glitzy things. Well, I want one too but if I do acquire one - it will start a new collection and who knows what will happen next. I am not even sure if they are even selling these, again I do not know anything about LVs. It's just that from all the Louis Vuitton bags I ever saw, this is the bag I can feel myself carrying. What is this bag really called? From root crops at our backyard to a delicious carbo-loaded Sunday snack! I saved for this book called Remember Me and 2 weeks ago, I finally bought it! Sophie Kinsella is one of my favorite authors. She is the mother of the Shopaholic series that I can't imagine having lived without! Remember Me is another book worth reading and spending on. I am definitely glued to this book! Anything can happen and life can be magically turned upside down. I just created an account in Plurk. 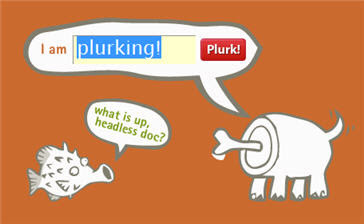 I think more people are talking about Plurk rather then Twitter. Hence, more plurking versus twittering. These words should be added to the dictionary! I don't have any friends yet, i don't even know how to find them! Let me know how I can follow you! There's an option to embed plurks in blogs but I lost it~ Plurk is very alien to me at the moment x.x I also wish to learn how I can plurk via mobile phone. Yesterday was a fun day at Burger King where all of us felt like kings and queen! Burger King is always perfect for hanging out with friends, or hanging out with your laptop. Aside from the free wifi service, they also offer a free back massage (sounds weird but people will get used to it!). i look haggard and deserve fast food! Daughtry Concert at Eastwood City - Lovely! When I first heard that we are going to see Daughtry, I was ecstatic because I have their song "Feels like Tonight" in my iPod. The concert last tuesday was different in that the venue is properly laid out, the setting was intimate, there were many attendees but it was never crowded. Going in and out was very easy, no lines at all, perfect. The sounds was great and you know how I love nature, the venue had trees within the concert tent and it was breezy that day. When they performed "What About Now", I was very thrilled and happy that I was there. Chris Daughtry had requested a camera flash trick from the crowd, where everyone will take a picture at the same time - causing camera flashes to create a magical display of lights. Definitely, I can't wait for the next concert that Eastwood City will bring to Manila. Thank you also to Heaven and Eggs for filling my tummy before I walked to the concert area. They had free "soup of the day" that was a heavenly mushroom soup, perfect pair for the roast that I ordered. I am in like with the drummer, the way he hits those drums is awesome!